Reading the New Testament: Chronological or Canonical? Marcus Borg has an interesting article in the Religion section of the Huffington Post today on the chronology of the New Testament. 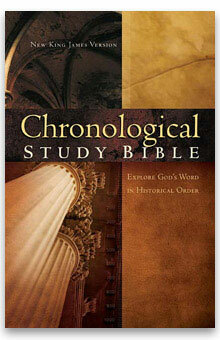 It seems to me there has been more interest in a “chronological Bible” lately, with several new Bibles appearing with the order of the books sorted by chronology rather than by traditional canon. Borg makes several excellent points on how reading the New Testament will effect the way were understand Christian origins. First, he says that “beginning with seven of Paul’s letters illustrates that there were vibrant Christian communities spread throughout the Roman Empire before there were written Gospels.” This is a great point, since the earliest unmediated witness to Christian thinking about Jesus are the Pauline letters. While Borg only accepts seven of the letters of Paul as authentic, he is correct to see this as the “earliest window” into Christianity. Reading 1 Thessalonians and Galatians is to see the struggles of the earliest Christians as the interpreted Jesus’ death on the Cross and the struggle to understand what Jesus means in the present age. Second, putting the Pauline letters first will force us to see the Gospels differently. They are “not the source of early Christianity but its product.” For Borg, the three synoptic Gospels are written after Paul’s ministry was over and Christianity had spread throughout the Empire. (This is the consensus view of the dating of the gospels.) While the content of the gospel was certainly present before the Synoptic Gospels were written, the theology present in the Matthew, Mark and Luke/Acts certainly reflects a time when Pauline Christianity was the dominant understanding of Jesus. While I am less confident about Borg’s dates for the Synoptic Gospels nor am I satisfied with separating them from the traditional authors, his point is nevertheless important. Third, Borg points out that even within the three Synoptic gospels, placing Mark first “demonstrates that early Christian understandings of Jesus and his significance developed.” This is a standard view of the synoptic problem: Mark write first and was later supplemented by Matthew and Luke. As Borg says, they added to and “modified” Mark to reflect their theological concerns. Again, a fair point and one I can accept, although I do not think the modifications were as radical as implied by Borg. 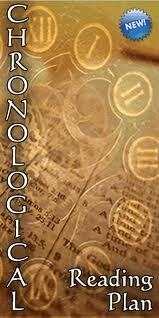 Fourth, Borg again follows consensus and places John late in his chronology. Reading “John separated from the other Gospels and relatively late in the New Testament makes it clear how different his Gospel is.” Borg correctly points out that the gospel is rich with “metaphorical and symbolic language” which functions as a “witness” of the theology of John’s community. I think that this is also quite acceptable, although I would also include the letters of John and Revelation at this point as well. Fifth, Borg states that “realizing that many of the documents are from the late first and early second centuries allows us to glimpse developments in early Christianity in its third and fourth generations.” This is perhaps the most difficult of his points to accept, since I am not willing to date anything in the New Testament in the second century. He is correct, however, that the later books are second or third generation Christianity. This is not a radical idea, since even in Hebrews 2:1 the writer of that letter heard the Gospel from others. The writers of the New Testament live at the end of the “first generation” and are writing their books as a legacy of tradition to the second and third generations. This continues well into the early centuries of the church, and is repeated every time there is a call back to the original sources (the Reformation, the Great Awakening, etc.) Reading the books chronologically highlights the theological trajectory of the New Testament documents, but also highlights the struggles the church of all ages faces. Articles in this journal have an interest in church and mission issues, such as the two-part article by Clinton A. Chisholm, “Afrocentricity & Black Consciousness: Challenges for Christianity.” Other highlights include Earlmont Williams, “The Missionary Message of First Thessalonians,” CJET 7 (2003): 22-40; and in the same issue Erica Campbell, “Ecclesiastes: Mission in a Post-Modern / Post-Christian World,” CJET 7 (2003): 41-56. All articles are available as PDF files and are readable on a wide variety of platforms. The articles are posted with permission from the respective copyright holders. I downloaded several articles and sent them to my Kindle account for reading with the Kindle app on my iPod (see screenshot). Once again, thanks to Rob Bradshaw for making this material available. Logos 3.0 for iOS appeared in the AppStore today, and it is a significant upgrade. If you already have the App, get the upgrade as soon as possible. If you have not yet downloaded the free app, now is the time! I personally use this App and have found it to be the best iPad app for reading (better that Kindle! ), and certainly the best for reading Greek and Hebrew. Downloading books is much easier, whole collections can be selected and moved to your iOS device. Since I upgraded to a 64MB new iPad, I have plenty of space for key books for reading when I am not in a WiFi zone. If you do not download a book it is still fully accessible via WiFi. The App now has a navigation pane which slides out like other iPad apps, giving access to your library. This works even better in split screen mode. This is a huge improvement since the earlier version required a return to the home screen to find resources. As far as I can tell, language tools (word study tools) are unchanged. I am still frustrated that the Hebrew and Aramaic Lexicon of the Old Testament (HALOT) is still unavailable, but that is the fault of the publisher, not Logos. The Third edition of Bauer (BDAG) looks great, although I wish it could be accessed more directly from the Greek Bible (it is a two-step process at this point). Notes can be created on the iPad itself rather than only on the desktop. I created a new note set (Thessalonians) and it appeared on my desktop version a few moments later. I find this helpful for working “out of the office,” I add a series of notes on a text as I read from several resources then pull that text into my regular word processor for full editing later. Logos has an excellent collection of annotation tools, going far beyond the usual set of highlighters. Readers who use various inductive study methods will find most of the colors / symbols they need. Here is a video explaining the benefits of Logos 3.0 for iOS, visit the AppStore for the free Logos App and start reading today. According to the Logos website, you get 41 books with the free app (including the SBL Greek New Testament and apparatus), and another 26 after you create a Logos account. It is worth creating an account since they give you Strong’s Systematic Theology and the New Nave’s Topical Dictionary, among other out-of-print books. The Biblical Studies Carnival is Coming! 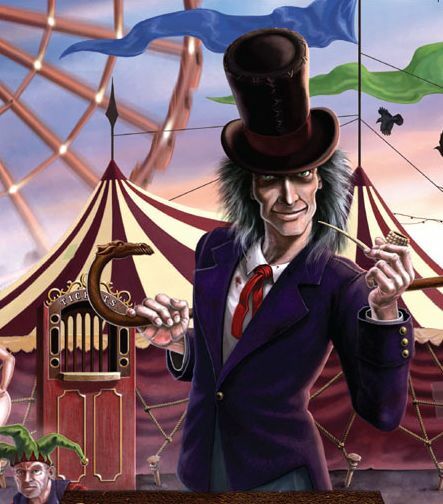 Jim West is hosting the August 2012 Biblical Studies Carnival at Zwinglius Redivivus. I am sure he has a marvelous carnival planned, but I am sure he would take a look at your links if you send them. I am looking forward to a great carnival from Jim. Here is the upcoming Biblical Studies Carnival schedule for the rest of the year. I need a volunteer for November. I would think that November would be one of the easiest months since SBl and ETS meets (along with many other groups at that time), usually generating some heat on the Blogs. If you are interested in the November Carnival, please contact me soon. I am also taking volunteers for 2013, if you quite ready for the commitment so soon. Email me directly at plong42 (at) gmail.com. November 2012 (post due Dec 1) Needs a Volunteer! December 2012 (post due Jan 1) is Abram K-J at Words on the Word. Why should you host a Carnival? The Biblical Studies Carnival is a service to Blog readers, highlighting the “best of the best” during the month. You will have the opportunity to highlight the blogs you find the most useful, challenging and insightful. Or perhaps the blogs you find funny. Carnivals are great for a new blog since the generate traffic and interest in what you are doing. I usually do not review fiction on Reading Acts, but I want to make an exception for this little book. I met Dan David at a local folk music event several months ago and we have played music several times since. A few months ago he handed me a copy of his recently self-published book, When Things Were Black and White: A Story from Detroit. (The book is available for Kindle as well.) He told me to read it and pass it on to someone else. I read the book with a bit of trepidation, since most of the time when someone hands you a book they wrote and self-published it is not all that great. But Dan’s book is very well written and edited and does not read like an amateur making a stab at a writing career. (The fact that Dan is an English teacher helps a great deal!) While it struck me first as a kind of “Wonder Years in Detroit” (minus Winnie Cooper), there are some deep themes in the book with which I deeply resonated. I want to touch on one or two of them and draw some implications for the church in America. When Things Were Black and White is a story cultural change in the early sixties, told through the eyes of a seven or eight year old boy named Detlef. The boy’s father is a police officer in Detroit who retires early and becomes the pastor of a small inner city church slated to be shut down. He pastors two such churches before moving out to the suburbs to start a new church at the end of the book. While there are a number of episodes in the book which are included to help create the world of the early sixties in the reader’s mind, this is not a sentimental memoir or nostalgic journey to David’s childhood. The title appears to refer to a time when things were simpler, decisions were easier because things were “black and white.” But the title has a deeper meaning. This was a time when America was Black and White, and it was a scary time for a child to learn about the world. One of the key themes which runs through When Things Were Black and White is the troubling issue of racism in the church. 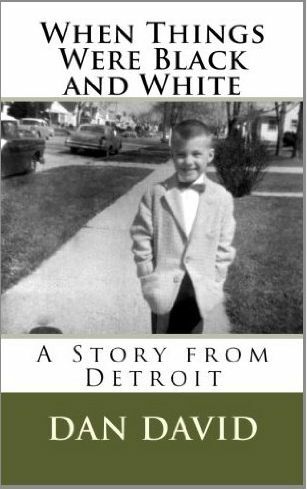 Detroit was particularly effected by racially motivated riots in the sixties, so Dan David looks at race through the eyes of a young boy who is clueless about the sort of bigotry which fuels hatred among members of his community. His father has no patience for his bigoted neighbors, but America in the early sixties was rife with bigoted and racist speech. Anyone who remembers 40 odd years ago knows that there are words which were not only acceptable, but used even by religious leaders. In the book, the young Detlef is shocked to discover that one of the men from his church is a racist. Mr. Lorraine helped around the church and was kind to the kids in the neighborhood, but he hated black people and occasionally voiced “wild and fear-filled predictions” of what will happen to the all-white neighborhood once black people began to move in. Even the teachers at his elementary school are racist, thinking that black people will be happier “with their own kind.” Teachers and students are opposed to integrated schools, fearing that the black children who are bused to their all-white school will destroy everything. Detlef sees through this, believing racism as a cowardly act: “The rest of the neighborhood racists seemed incredible cowards. The were like jackals, brave enough when they were in the pack, but skulking and cowardly when caught alone” (184). Influenced by his father, he comes to realize that the bigots in his school are foolish to hate someone based on their skin color. At one point in the book the family moves to Chicago, where Detlef has more problems with poor white people than he did with the black students in Detroit. I find this a particularly convicting point, since it is well known that the most segregated time in America is Sunday morning when people go to churches which seem as though they are built along racial lines. I have visited churches in the south where unacceptable racist language was used frequently among the “Christian” white kids. There is a kind of cowardly implicit racism in most churches (probably running both directions), creating churches which are ethnically non-diverse. This is not at all a good thing, especially since those who are in Christ are neither “Jew nor Gentile,” Paul says. Nor are they Black and White, Asian, Hispanic, or whatever. In Christ we are supposed to set racial differences aside. Looking at the world of the mid-sixties through the lens of Dan David’s book, I cannot really say that we have set those differences aside some fifty years later. When Things Were Black and White is a great title, since the church was “black and white” then. This little book is a window into that now distant world of the sixties, a time which seems so strange and unenlightened to me. I would like to think we have come along way since the racism of those days, but it is not as far as we need to go. Colin G. Kruse is senior lecturer at Melbourne School of Theology and author of several other fine commentaries including the Letters of John in the Pillar series and two short commentaries on 2 Corinthians and John in the Tyndale New Testament series. He wrote a monograph on Paul in 1997 (Paul, the Law, and Justification, Hendrickson, now reprinted by Wipf & Stock, 2006). Kruse is not a representative of the New Perspective (which would not be expected in a series edited by D. A. Carson), but he does not march lock-step with the traditional view of Paul either. This provides something of a fresh perspective on Romans, a fairly readable commentary which is focused on the text of Romans without being overly distracted by the current scholarly debate on the relationship between Paul and Judaism. 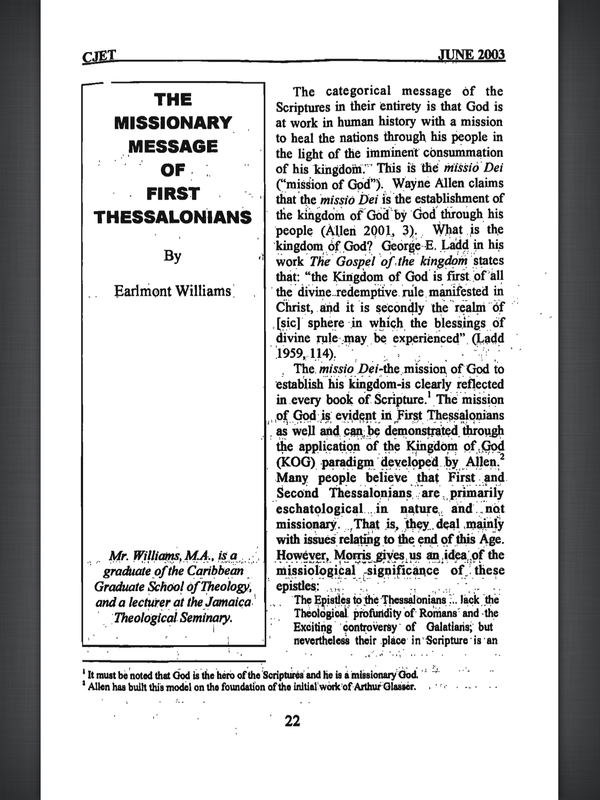 This commentary replaces the 1988 Leon Morris volume in the Pillar series. While it might seem strange to replace a commentary after only 25 years, much has happened in the study of Paul since Morris’s work was completed. While E. P. Sanders wrote his Paul and Palestinian Judaism in 1979, there is nothing in Morris’s commentary which interacts with Sanders or his view on Judaism. In fact, Morris had a single paragraph in his introduction on the topic of Romans and Judaism and he cites only J. Christiaan Beker, Paul the Apostle. Morris’s Romans commentary is still valuable, but it reads like a commentary produced in the seventies and does not address some of the questions more recent scholars have put to the book of Romans. Since Morris’s commentary appeared, scholars associated with the New Perspective on Paul have developed many of Sanders’ ideas well beyond Paul and Palestinian Judaism. Commentaries from James Dunn and N. T. Wright have brought the insights of the New Perspective to bear on the letter to the Romans, while others such as Schreiner and Moo have contributed major commentaries from a more traditional perspective. In addition, Robert Jewett’s excellent commentary on Romans appeared in the Hermenia series in 2006, providing yet another excellent and detailed study of Romans. It is therefore understandable that the Pillar Series would offer a new commentary on this important Pauline letter. The Introduction. The thirty-three page introduction covers the standard issues expected in a Romans commentary and Kruse does not stray far from a traditional view of when the book was written. He understands the primary purpose of the book to be Paul’s attempt to minister via a letter to Christians in Rome for whom he had an apostolic responsibility. The Christians addressed are a mixed congregation of Jew and Gentile, like Paul’s churches in Galatia and Corinth. Paul wants to “exercise ministry by letter” as a forerunner to his planned ministry in person (10). The secondary purpose is to prepare for a planned mission to Spain. The longest section of the introduction (14-22) is devoted to the New Perspective on Paul and how that perspective has understood the book of Romans. He primarily interacts with Wright and Dunn since they have adapted and extended Sanders’ initial insights and both have written major commentaries on Romans. Kruse does not engage in strawman tactics by using early statements which have been revised and clarified. Rather he cites the most recent work by Dunn and Wright (Justification, 2009). Kruse makes several conclusions on the New Perspective which guide his commentary. First, he finds that the New Perspective has correctly pointed out Covenantal Nomism in some Second Temple Period literature, but legalism does appear in some texts (especially 4 Ezra). This seems to be the conclusion of many Pauline scholars who have read Sanders and attempted to work with the literature of the Second Temple Period. In many ways, the New Perspective is a helpful correction, but Sanders’ description of Second Temple Period Judaism is not the only form known from the sources (see the essays in Justification and Varigated Nomism, Baker, 2004). Second, for Kruse, by the time Paul wrote Romans the phrase “works of the law” referred to the “whole law” not simply the “boundary markers” of circumcision, Sabbath, and food laws (176). After evaluating Wright and Dunn, Kruse concludes that when Paul says “no one is justified by works of the Law” (Romans 3:20) he means keeping the whole law, not simply the boundary markers. What I find missing here is any discussion of the phrase “works of the Law” in the Qumran literature, especially 4QMMT. Since he has a substantial excursus on the phrase “works of the law” (173-6), I would have expected some interaction with Qumran, especially since Wright emphasizes 4QMMT frequently. I think that this is implied by Kruse’s comment that the earlier use of the phrase primarily meant “boundary markers,” but the text is not referred to in the introduction or commentary. Third, Paul was critical of ethnocentricism and exclusivism as well as legalistic tendencies of Second Temple Period Judaism. While Sanders is famous for saying that Judaism was not a legalistic religion in the Second Temple Period, Kruse understands that at least some Jews were in fact legalistic, and it is this legalism which Paul argues against in Romans. Fourth, justification by faith “was articulated as part of his defense of the incorporation of Gentile believers into the people of God without having to submit to circumcision or take upon themselves the yoke of the Law” (21). This does not mean that Paul created “justification by faith” so that he could do Gentile ministry. Kruse cites Machen, “Paul was not devoted to the doctrine of justification by faith because of the gentile mission, he was devoted to gentile mission because of the doctrine of justification by faith” (20). Fifth, Paul’s law-free gospel did not imply a denigration of the law. Rather, Paul argues that the Law functions as a great privilege for Israel, but one that ultimately increased sin and awareness of sin (29). Believers are free from the Law, but they are not free to live sinful lives. While they live under grace, the Law can have a “educative role for believers,” a guidance for godly living (29). Last, with respect to the controversial topic of justification, Kruse states that his understanding of Paul is that justification is “God’s declaration in favor of the believer” (22). Justification is forensic, referring to “God’s decision as a judge to justify sinners (27). This sounds very much like the traditional view of Paul, although Kruse does admit that justification is not itself the whole gospel message. Wright frequently quips that his critics use the word justification to mean “total salvation,” Kruse seems to agree with this critique. The Commentary. The commentary proper moves through Romans pericope by pericope. Each section begins with a brief introduction and text of the NIV 2011 is provided. The body of the section then moves verse by verse, commenting on the English text of Romans (in italics). All references to Greek are transliterated and for the most part appear in the footnotes of the commentary. In addition, Kruse often interacts with subtle exegetical points in the notes which may not be of interest to the general reader. This makes the body of the commentary more readable and useful for a pastor or teacher preparing to preach a text in Romans. Kruse interacts with a broad range of scholarship, including both classic commentaries as well major recent contributions. He makes frequent reference to Cranfield (ICC, 1975, 1979), but also to Dunn, (WBC 1988), Fitzmyer (AB, 1993), Byrne (1996, Sacra Pagina), Moo (NICNT, 1996), Wright (NIB, 2002), and Jewett (2006, Hermenia). I especially appreciate Kruse’s style of listing several options (usually with Roman numerals) and clearly identifying his view. This respectful weighing of options makes it easy to wade through what might be an otherwise daunting array of opinions. Like most of the commentaries in the Pillar series, Kruse deals with details which go beyond the text in a series of excursus, or “additional notes.” These are sometimes aspects of the New Perspective, such as “Justification” or “Works of the Law.” A few of these sections deal with troubling exegetical problems, such as “All Israel will be Saved” (448-9) or the “Identity of the ‘I’ in 7:7-25.” More often Kruse develops an element of Pauline theology, such as “Natural Theology” or “Eternal Life in the Pauline Corpus.” These sections are usual brief and could be skipped, but they do provide a connection to larger issues of Pauline theology. These brief notes form a sort of mini-Dictionary of Pauline Theology. I would have appreciated seeing a list of them in the index sorted by topic, but the do appear in the table of contents. Conclusion. Kruse has contributed an important commentary on what most consider Paul’s most important book. While it is not as lengthy or detailed as some, it is an excellent commentary for teaching and preaching the book of Romans. I am not sure if it will become the “first commentary off the shelf” for me, but it is instructive and stimulating. Kruse is a careful scholar who has written a commentary which will serve the church for years to come. If you are using Logos Bible Software, follow the link and get the free Daf Yomi reading plan for the Babylonian Talmud. Naturally Logos will sell you a copy of the Babylonian Talmud (30% off this week). In 1923, Rabbi Meir Shapiro proposed a reading plan for Bavli which consisted of reading one page (two sides) per day, following the most common pagination (that found in the Bomberg/Venice Talmud of 1523, which was followed by most subsequent editions, including the popular Vilna Talmud of 1835). Thus each cycle covers the entire Talmud in about 7 years, 5 months. Unlike reading plans which can start at any time, Daf Yomi (Page of the Day) has each reading fixed to the calendar so that the entire community is reading the same Daf together each day. 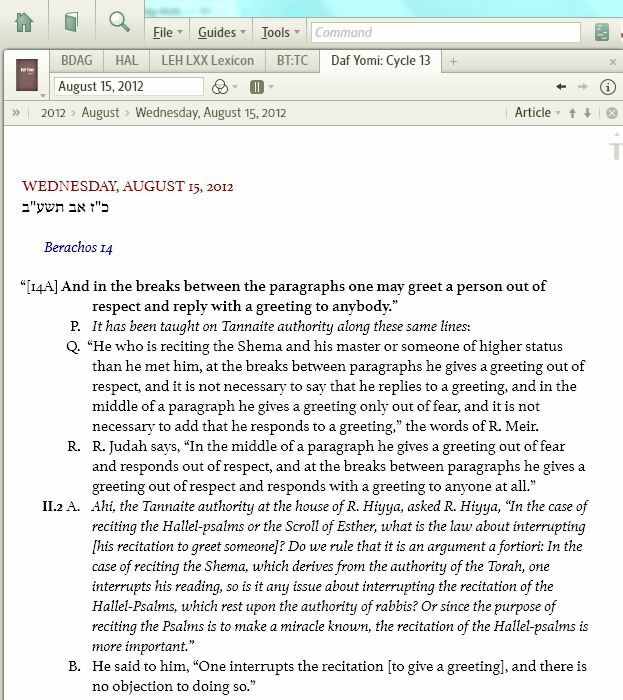 This synchronization has encouraged new benefits in the digital age, with blogs and podcasts and other internet resources dedicated to helping answer questions about the day’s Daf—very handy for new readers of the Talmud. Daf Yomi has grown to be a very popular approach to Talmud study. Since 1923, the entire cycle has been completed 12 times, with the last finishing on August 2, 2012 (an event which culminated in the celebration of Siyum HaShas with an estimated 300,000 participants in large venues around the world marking the occasion). This reading plan starts the next day on August 3rd and covers the complete 13th cycle, which will finish in January of 2020. Like most people, reading through the Talmud is an intimidating prospect, the Daf Yomi reading plan makes it possible to achieve this goal over the next 7+ years. Despite being called a “reading plan,” I had to load the reading plan as a book on both my desktop and iPad versions of Logos. The Desktop version worked fine, but the link for “today’s reading” did not work on the iPad app, and the link to the actual reading opens in a reference window rather than jumping to the portion directly. I was able to scroll down and get to the right place, but it is two or three step process. Hopefully the links can be fixed. While this resource might not be valuable for all, kudos to Logos Bible Software for making the Daf Yomi reading plan available for free.